When thirteen-year-old Ronan Truelove’s seemingly ordinary mom snatches him from school, then sets off on a high speed car chase, Ronan is shocked. His quiet, nerdy dad has been kidnapped? And the kidnappers are after him, too? The Blood Guard is middle-grade fiction that even adults can enjoy. There is no doubt that the story will sound familiar to readers of the Percy Jackson books, which will resonate with young readers. 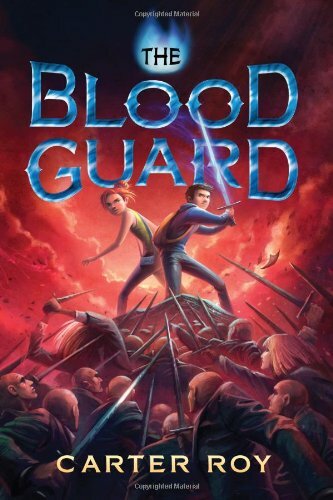 The Blood Guard is an exciting and intriguing book that stands on its own and will provide a new set of adventures to the loyal Percy Jackson fans. Our main character is Ronan. He is a typical student, completely unaware of his full heritage until his world is turned upside down in a moment. Ronan is yanked out of school and some fast action begins. This is when you start holding onto your seat. My favorite departure from Percy Jackson is that mom is not a side-line character. She is a member of the Blood Guard and she is pretty darned amazing. She is most definitely not the typical mom. She is a rescuer, a getaway driver with mad skills, brilliant, talented, and out to save the good in the world. She is a super badass mom as well as a tender loving mom. She is just the start of it though. The evil characters are well…evil. The heroes are smart, loyal, wear their hearts on their sleeves, and care for the good of others. The author gives us three different names for the 36. Tzadikim Nistarin, The Righteous Ones, or simply the Pure. Some quick, and I do honestly mean quick, research provided me with The Legend of the Lamed Vavniks. This is an ancient writing that helps explains those three titles, all of which are based on the Jewish legend. The Jewish legend of the Lamed Vovniks describes thirty-six righteous men in every generation upon whose merit the world is kept from entire destruction. Based in part on the story of Abraham and his conversation with the Lord about the destruction of Sodom in Genesis 18, the Lamed Vovniks are those who, by virtue of their compassion for others and the prayers they offer, cause the Lord to answer, “I will spare all the place for their sakes” (Genesis 18:26). There are quite a variety of websites related to the legend; here is another site that seems interesting. Roy does deviate from at least one point of the legends. His Pure are of the equal opportunity type, being both male and female. As the Percy Jackson books are based upon Greek mythology, The Blood Guard series is based upon Jewish mysticism. In both series’ there is a component of magic. If you are comfortable with those two issues then this is a great book for your child. The message is positive in that it’s protagonists seek to overcome evil. They are kind to strangers and odd-balls, incorporating them into their sphere without question. Good things happen and it is a truly fun story to read. I received a galley in exchange for my honest and unbiased review. My thanks to NetGalley, the author, and publisher.